Below you can view all the homes for sale in the Annsbrooke subdivision located in Conyers Georgia. Listings in Annsbrooke are updated daily from data we receive from the Atlanta multiple listing service. To learn more about any of these homes or to receive custom notifications when a new property is listed for sale in Annsbrooke, give us a call at 404-998-4166. This Is One Of The Best Layed Out Home You Will See! MLS#8560492. Re/Max Agents Realty. Swim/Tennis Community - Clubhouse And Playground - Large Home - Bring The Family. Must See! MLS#8554889. Atlanta Peach Mgmt.& Realty. Home Also Features A Security System And Sprinkler System, A Spacious 2 Car Garage With Plenty Of Extra Parking Space Outside. MLS#8547932. 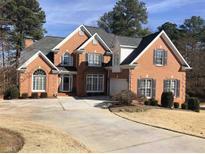 American Realty Pro Of Ga.
Must See To Appreciate This Beautiful Spacious House In A Lovely Neighborhood MLS#8527212. Listwithfreedom.Com Inc.
Back Staircase Leads To Family Room Style Keeping Room And Thoughtfully Appointed Kitchen. All Over A Full Basement. MLS#8491007. American Realty Pro Of Ga.